More than one million people lined the River Thames in London on Sunday, 3rd June to catch a glimpse of Her Majesty Queen Elizabeth II as she celebrated her Diamond Jubilee with a River Pageant involving 1000 boats. And in typical British style the weather was dreadful, with heavy rain doing its best to spoil what was supposed to be the highlight of the UK’s Diamond Jubilee weekend. But the cold, the wind and the rain proved no match for the DPA microphones that were the unsung heroes of the event. Even in atrocious conditions they worked perfectly and all of the microphones used to record the orchestras and choirs delivered a seamless performance. DPA 4088 Directional Headset Microphones were used to mike the Royal College of Music Chamber Choir who performed with the London Philharmonic Orchestra on Symphony, the last of 10 Herald music barges taking part in the pageant. Photographs of the 12 choristers, soaked through and with their hair plastered to their faces, were transmitted around the world for days after the event – and there in the pictures were (among others) DPA’s sturdy microphones on the choir girls, doing their best to defy everything Mother Nature could throw at them. DPA microphones also featured on two of the four music barges equipped by Thames Audio. Thames Audio director Pete Cox says: “We used DPA microphones on Edwardian, which carried the Academy of Ancient Music who played Händel’s Water Music, and Valulla, which carried 30 musicians from The Band of Her Majesty’s Royal Marines Plymouth, one of the most famous and highly regarded military bands in the world. Thames Audio had a total of 14 DPA d:vote 4099 instrument microphones on Edwardian. These were clipped onto the violins and woodwind instruments using DPA’s dedicated instrument clips. On Valulla, Thames Audio used DPA d:vote 4099s with the appropriate clips for the trombones, French horns and cornets. They also used DPA 4060 miniature mics, which were taped onto the clarinets and saxophones and actually mounted on the helmets of the musicians who were playing piccolo. In total 18 DPA microphones were used. Thames Audio sourced part of its stock of DPA microphones from freelance sound engineer Ian Barfoot, who was also recruited to handle the sound mixing on the day. 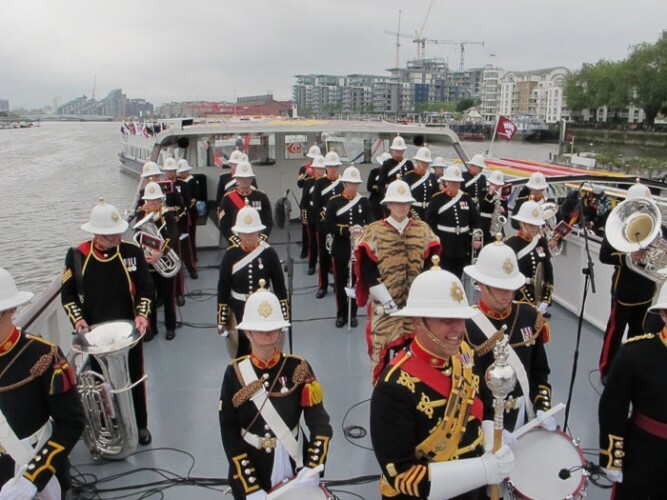 The music performed during the Queen’s Diamond Jubilee pageant, believed to be the Thames’s most spectacular in 350 years, was recorded by the BBC for both broadcast and archive purposes. Live coverage of the event was transmitted to BBC Big Screens in 22 locations around the UK.